This week the challenge is a Christmas challenge! I have two cards for your today. 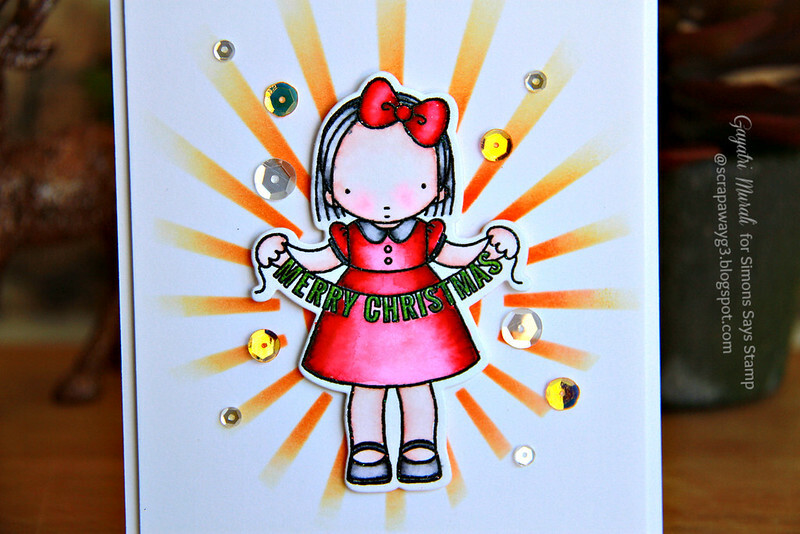 For both the cards, I have used Pure Innocence: Merry Christmas Banner stamp set and coordinating die. On my first I heat embossed the cute image in black and watercoloured in traditional colours. I used Zig watercolour pens to colour my image and then die cut the image using the coordinating die. For the background, I used MFT’s Sunray stencil and sponged Spiced Marmalade and Ripe Persimmon distress inks. I did not sponge the inks all the way to the end but faded it off towards the end. I then adhered the image using foam adhesives. 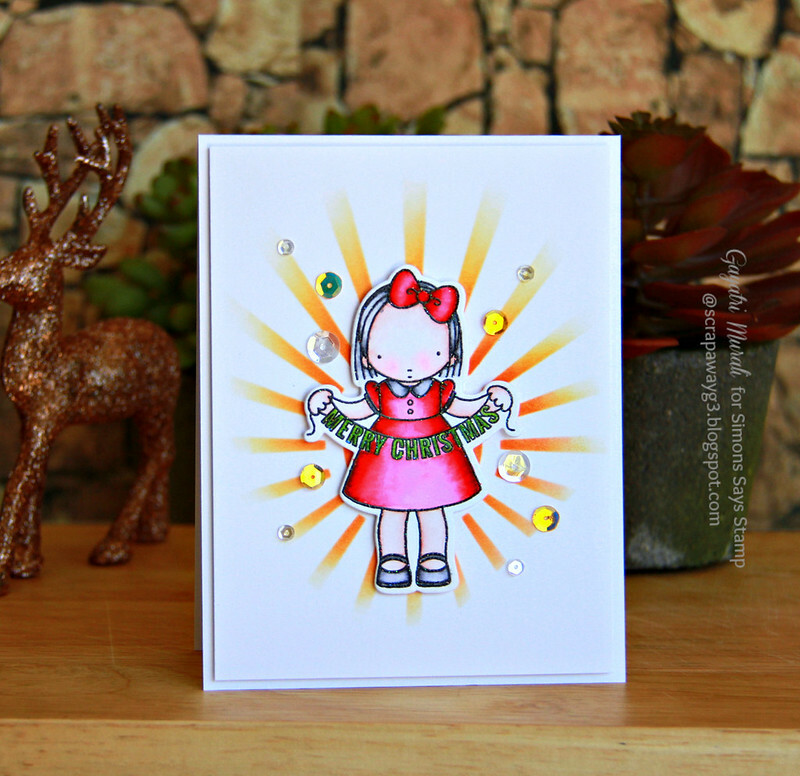 Embellished with Sparkly Clear and Sunshine Glow iridescent sequins from Pretty Pink Posh. Here is a closeup of the cute girl holding the Christmas banner. For the second cards, I white heat embossed the same girl’s image and watercoloured her using non traditional colours. For the background, I smooshed Salty Ocean and Peacock Feather distress inks. I love the unpredictable hard and soft edges of the watercolour on the background. Once dry, I adhered the girl image die cut on the background using foam adhesive. Embellished with Sparkly Clear sequins from Pretty Pink Posh. Here is closeup of the card. I love both by the first card is my favourite. I like the black embossing and the colours of the girl’s dress more than the white embossing. Which one is your favourite? Adorable cards Gayatri! Such a cute image! Your coloring is fabulous! Gorgeous cards Gayatri 🙂 both are very cute but I think I do prefer the black embossing. your colouring on both of them is brilliant ! Oh my…how beautiful are these two cards! Gorgeous work as always, Gayatri! You've shown off this sweet stamp beautifully, Gayatri! Wow, love your two cards. I especially love your sun ray card ! Both gorgeous cards Gayatri, the first one is stunning and beautifully coloured. The second is has a super water coloured background and pretty colouring on the cute image!! As always, I love how creative you are! I like the vividness of the warmer colors, but you hit all my favorite colors with the softer, edge-colored look! These are fabulous, Gayatri! I love how you used the same stamp and die set to show two great options with the stamps!! These are so sweet! I love the starburst! Whoa, girl, these are both AWESOME! Thank you for sharing your FUN cards! Two equally wonderful cards! I love the different backgrounds and colors as well as how you've painted them! Thanks so much for sharing!! !